Born in Montreal in 1977, Marjolaine Goulet holds degrees from the Conservatoire de Musique de Montréal (graduated with honours, John Millner’s class, 2001) and McGill University (Artist Diploma, John Zirbel’s class, 2003), where she won the Tani Salsinger gold medal, which is given to the most distinguished artist in the department of musical performance. Her prodigious talent has earned her many prizes, scholarships, and honours, including a prize at the Paxman Young Horn Player International Competition, the Paul-Merkelo scholarship, the scholarship from the McAbbie Foundation, the SOCAN prize for best interpretation of a Canadian work in the Montreal Symphony Orchestra competition, a fellowship at the Aspen Music Festival in Colorado, first prize in the brass category at the National Music Festival of Canada, and a scholarship from the Quebec Council for Arts and Letters. An experienced orchestral musician, Marjolaine has toured Asia and Europe with the Orchestre Symphonique de Montréal and played with the World Orchestra, as well as holding the position of Principal Horn with the Orchestre Symphonique de Montréal since 2004. As a soloist, she has appeared with the Orchestre Symphonique de Québec as well as the orchestra at the International Lanaudière Festival. 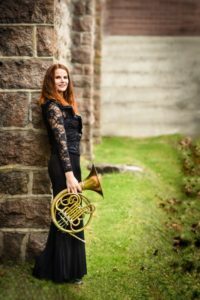 Abroad, her artistic collaborations include playing solo horn with the Berliner Sinfonie Orchester, the 1-Frauen Kammerorchester (Mahler concert series), the Baroque Music Festival in Regensburg, Germany, and the Washington Chorus in the United States. Marjolaine Goulet is interested in historical interpretation and plays natural horn and Baroque horn. Fascinated by Gustav Mahler and Viennese music, she especially adores the Vienna horn and misses no opportunity to travel to Vienna. She can be heard on various recordings playing modern horn, Baroque horn, and Vienna horn on the Atman and Analekta labels, in addition to symphonic broadcasts for the Espace Musique on Radio Canada. With the Jeunesses Musicales in Canada, she has participated in more than 200 concerts with young (and not so young) horn players. Sharing her passion for the horn and music are close to her heart. Ms. Goulet is currently the horn professor at the Conservatoire de Music in Montreal and Saguenay.